So we went up to Philip’s bar the other night for the much-anticipated mezethes. 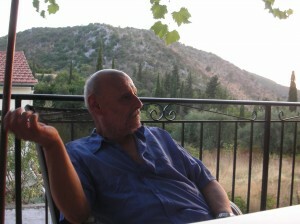 I should begin by explaining that Philip has owned and run the kafeneion for as long as we have been coming to Loutses – 33 years. Back in the ’70s, it was one of several places to find a drink in the village – a long, crowded room that was as much a community centre as a pub, with a wood stove in the winter and peanut shells on the floor. It also boasted the only telephone in Loutses and we would wait our turn to step into the private closet to call home. Sometimes it took half an hour to get through to England or Canada; sometimes it didn’t work at all. Philip befriended us and we befriended him; he stood as godfather at our son’s christening, to the astonishment of the local priest who hadn’t seen Philip in his church for decades. In doing so, he became our koubaros and we became koubaros and koubara (surely the same root word as the Neapolitan “gumba”) to his entire family. Over the years, that relationship has endured. The bar is smaller now since Philip’s renovation in the 1980s and is decorated with a lifetime of souvenirs including paintings of Philip and his late father, Leonidas, arcane photographs, a lithograph of Hopper’s Nighthawks, a ballerina’s shoe from the time when we lent our house to a group from the National Ballet of Canada, some taxidermical caymans from Philip’s time in the Merchant Navy, etcetera, etcetera… This summer, he decided to add a gastronomical component, building a small but very well-equipped kitchen behind the bar and bringing in Spiros Syriotis as chef and partner in the enterprise. There are smart new blue tables and chairs outside on the terrace that overlooks the valley and a new air of energy as locals and tourists and English expat residents drop by to wile away the evenings and watch the newish moon set behind the hills like a sliver of tangerine in a Martini. Philip provided a great many recipes that Wendy and I used in our book, A Kitchen in Corfu (about to be republished in England) and we have eaten many splendid dinners with him in his home behind the kafeneion. He has an organic garden and much of the produce that now goes into the mezethes comes from there. I reminded him of an antique method for preserving fish by frying it and then confiting it with vinegar, rosemary and raisins. He chuckled and disappeared into the kitchen, re-emerging with a saucer of the identical fish (firm and sweet and tangy and altogether scrumptious) along with some delicate white anchovy fillets marinated in olive oil, vinegar and garlic. Chef Spiro’s offering were more in the meaty line – small pieces of very tender pork, some in a piquant sauce of mustard, vinegar and rosemary, others in a different treatment of tomato and hot paprika served with crisp fried potatoes and halved cherry tomatoes from the garden. There was chicken in a sweeter, herb-fragrant tomato sauce, and juicy keftedakia – crisp-surfaced little meatballs of minced beef, garlic, onion, parsley and breadcrumbs. When some of our friends held a mosaic school at the bar over a long weekend in June, Spiro made tiny vegetable pies of pumpkin and zucchini in phyllo – irresistible. To be sure, it adds a delicious new dimension to life in Loutses. 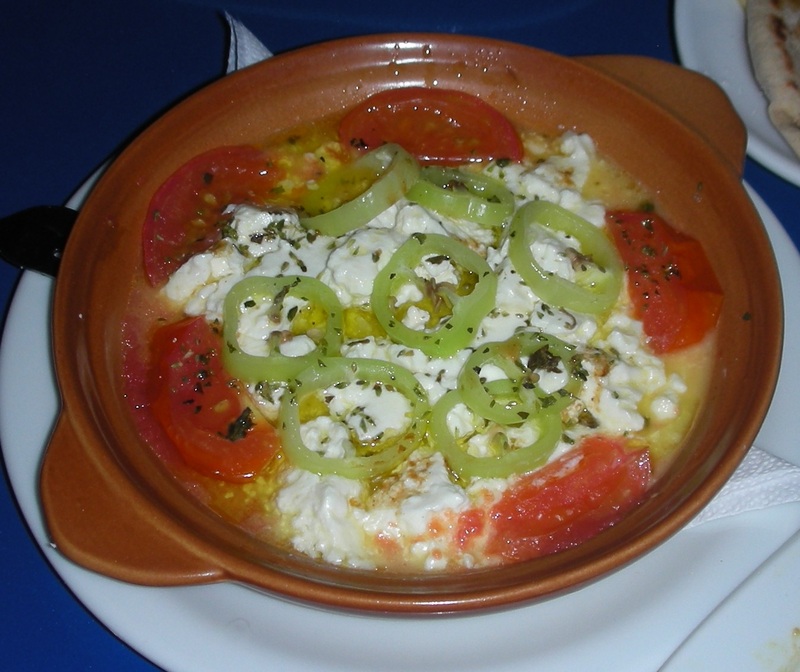 My favourite dish was feta baked in a shallow earthenware platter with baby tomatoes and hot green peppers until the cheese was almost liquid. Triangles of Spiro’s homemade pita bread were the perfect utensil for digging in. Tomorrow there will be other things on the menu, depending on what is growing in the garden. To wash it down, nothing beats a stoop of Philip’s own rosé wine or a bottle of his own rosé “champagne” – an entirely unexpected creation aged in his apothiki storeroom that combats the relentless heat of Greece in August to perfection. Very sentimental kubare and very funny as always, push my memories years behind. Thank you.